So! I've been keeping a developer's log over on the TIGSource forums for quite some time now. While that's been useful to me in terms of getting the word out and getting feedback from other developers, I'd like to transition back to posting regular updates about development here on the Sinister Design forums instead. More attacks are on the way soon! The swordsman's melee and double strike attack animations are now in the game! More are on the way. 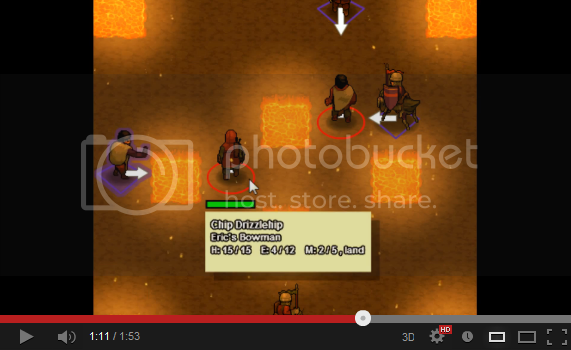 Meanwhile, I'm tinkering with the game's values to make the attack animations sync up better. The Cavalier's Lance animation and Psy Healer "cast" animation are now in the game. 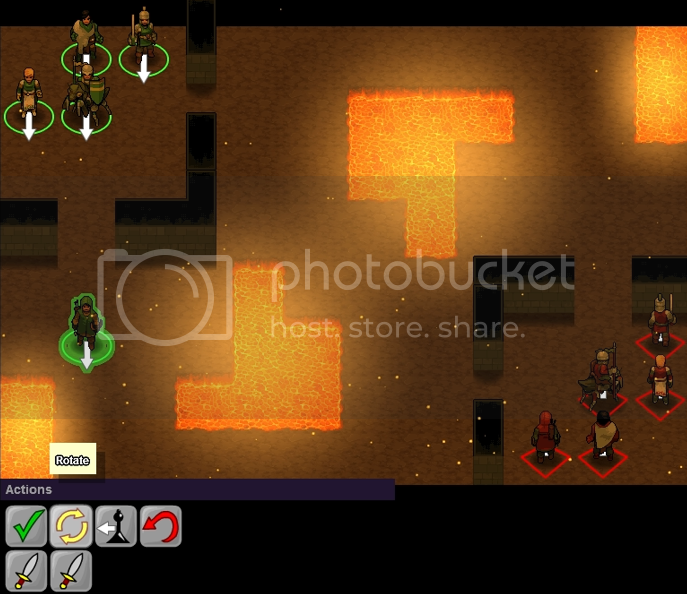 I've finished adding a new dialog trigger into the game, OnCharAttacked. This one works just like OnCharDeath, but it triggers before an attack is launched. It specifically looks for a non-Shield attack launched by an opponent, so you shouldn't accidentally trigger it by healing a character. Good for boss taunts! I'll be adding some more variations on this in the future as needed. Right now, I'm finishing up creating a promotional video for the Indie Megabooth. Suffice it to say that I'll be talking more about that soon. Yesterday and much of today was devoted to capturing video for the Indie MegaBooth promo video. I'm not sure how much of it they're going to use, but I'll be posting the full thing here a little later. So! I've been working on the interface for Telepath Tactics some more. The latest improvement is that the attacks bar is now draggable, and remembers the location you last left it onscreen. Another improvement: the bar's background is now "see through"--not just visually, but in terms of mouse interactions as well. You can now mouse over and click stuff being blocked by the bar, in other words, so long as it's a portion of the bar without a button. I'm strongly considering changing the attack bar into a box and moving all of the action buttons into it. Put another way, I'm moving back toward something like the GUI window from Telepath RPG: Servants of God, albeit one that you can position more flexibly. It's weird to end up back with using the GUI window, but it seems to represent the best compromise between ease of use and minimal screen clutter that I've managed to find so far. The new GUI window is in-game and working; I created a quick video to show it off. Take a look! So! Artist Benn Marion has put some finishing touches on the game's title screen art, and I've updated the game with said art. It looks much improved, I think! I'm currently in the middle of adding in a feature where you can display the current value of a custom variable within game dialog, which should prove pretty darn handy for giving the player information about the state of the game. I'll post more about that feature when it's done. typing -VAL:Blah- will replace “Blah” with the value of a custom variable; obviously, you'll be typing the name of an actual custom variable there, not Blah (unless you created a variable named Blah for some reason). If you haven't set a variable by that name yet, the game will just display a 0 by default. I stayed up late last night reworking the code that sets the pan boundaries for maps; it now does not permit you to pan beyond the edge of the map when in fullscreen mode. If your screen is wider or taller than the map, it will center the map onscreen and not allow panning in that direction. This has done a lot to reduce the intrusive, empty black space at the edges of maps that people were complaining about. The 6' vinyl banner for the PAX East booth has arrived! I am inordinately excited about this. 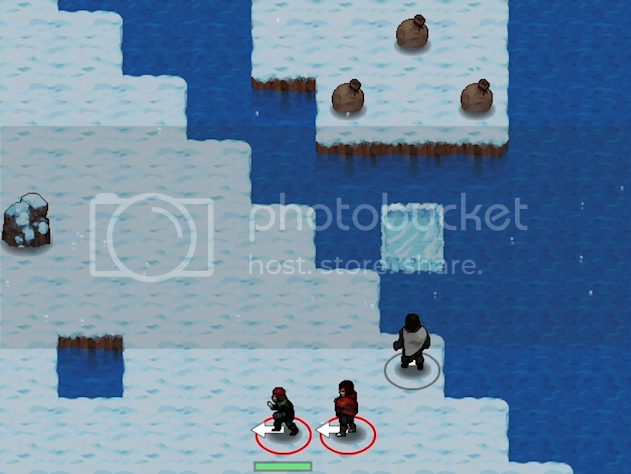 Telepath Tactics now supports the creation of ice bridges! Hit an empty water tile with a Cold element attack to create an ice bridge on that spot. Ice bridges are brittle, and will be destroyed instantly by Heat or Crush attacks; otherwise, however, they can be useful for traversing waterways if you don't have an Engineer handy. Click below for a video! I fixed a few bugs this morning, but otherwise spent all day (and I do mean all day) recording and editing footage to put together an updated "What is Telepath Tactics?" trailer. This is the result: http://youtu.be/ZEpqPTRj4ao?hd=1 Time to go eat a brownie or something. 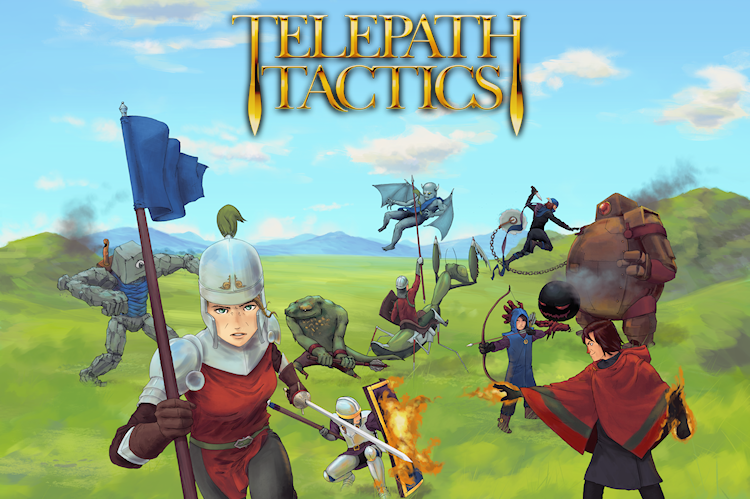 The February monthly update for Telepath Tactics is up on the main page! Go ahead and check it out.